In honor of National Poetry Day, TED-Ed asked writing teachers at the San Francisco Writers Grotto to recommend their favorite poems worth sharing. Below, a short poetry reading list for TED-Ed learners of all ages. For younger readers, I would go with some of the easier Robert Frost poems, which would set the stage for the more complex ones. “Design” is a great one for middle school students, allowing a good discussion of imagery and metaphor and rhyme (when it works and when it doesn’t) and structure … and the lessons of nature. 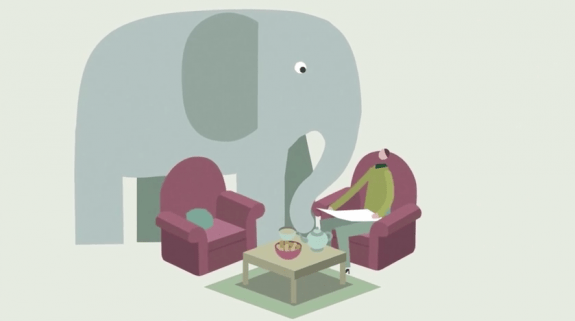 Pair with the TED-Ed Animation: The art of the metaphor. Poetry is about concision, beauty — and the sudden swerve that tweaks the reality we thought we knew. With Billy Collins, there’s no pedantic tone, no overwrought adjectives. His poems are the verbal equivalent of a swimming hole — simple yet revelatory, familiar yet surprising, speaking right to the most primal parts of us. Pair with the YouTube animated video of “The Country” by Billy Collins. I love the way Mary Oliver pokes fun at herself, realizing that poetry is paltry next to a day romping about in nature. But her dog has also provided the very essence of the poem, so the joke is a bit on him too. Pair with this audio recording of the NPR All Things Considered episode in which American linguist Samuel Jay Keyser explains why he thinks this Wallace Stevens poem is the best short poem in the English language. This poem is creepy as hell and even after all these years, it still makes the hair stand on the back of my neck. Kids love a good scare, and this one is very atmospheric. Pair with the TED-Ed Lesson: A refresher on Edgar Allan Poe. Marie Howe wrote this poem to her younger brother after he died of AIDS. To me, the poem captures how mundane are the details of everyday life, and how flawed and absorbed we humans are in the business of our daily selves — and yet at the same time it manages to step back and see all of that from a grand perspective and thus illuminate its beauty. For high school students, who are often even more wrapped up in their own worlds, perhaps it would give them some sense of the fleetingness and tenderness of life, and of each life’s place within the greater whole. Pair with the TED Talk: Sarah Kay: If I should have a daughter …. I love this poem because it is a simple message and ends simply (and surprisingly) because some of the language is beautiful and complex. Stafford creates a sense of the world he is talking about and pulls the reader in to participate. This poem has never failed to move people when I’ve shared it. Pair with the TED-Ed Animation: Become a slam poet in five steps. I have many favorite poems but here’s one. It acknowledges the suffering we all feel, and offers a response. Pair with the TED Talk: Clint Smith: The danger of silence. There is a mix of pathos and power in this poem. It reads, to me, both like a suggestion and a warning. Something that says, ‘Here are the options you face. Which fate will be yours?’ Pair with the Crash Course educational video: Langston Hughes & the Harlem Renaissance. I’ve loved this poem since I first read it as a teenager, in a collection of English language poetry I found in the high school library at Kristiansand Katedraleskole in Norway. The last stanza became sort of a pole star of how I wanted live my life. In rock star terms: No Regrets! A sweet ending, might seem too sweet, but it’s earned by the grit of previous lines. Thirty years later, at age 47, I still think it’s a great life ideal to strive for. Sometimes I recite it to myself when things feel dark. And it helps. If that’s not the power of poetry, what is? Pair with the TED Talk: Stephen Burt: Why people need poetry. I love this poem! Very fun. Octavio Paz’ Sun Stone (Piedra del Sol), trans. Muriel Rukeyser. It is not light reading but an enlightening joy. Thank you. This was a true treat…an indulgence…I am now in love with Billy Collins….and Percy and Books was delightful…thank you for posting! To a mouse – Robert Burns followed by To a Louse. I chose Robert Burns because , to me, he represents the highest form of poetic genius. If his contemporaries are to be believed, he composed his poems in his head, sometimes as he watched the events unfold he worked out the details. He wrote down the poem when he got to pen and ink. To a Louse reads that way as he sat behind Jenny in Church. His brother said that he composed To a Mouse leaning on his plow. His genius was also to see the universal truth in these simple poems. One of the most powerful threnodies—ever. Couple it with “Dirge without Music” by Millay. Lovely. Marge Piercy, “To be of use” from Circles on the Water. Copyright © 1982 by Marge Piercy. Used by permission of Alfred A. Knopf, an imprint of the Knopf Doubleday Publishing Group, a division of Random House LLC. All rights reserved. that poetry is not always planned? It doesn’t have to have a rhyme. It doesn’t have to keep the time. That kind of pressure is just soooooooo wrong. Poems come from the heart. and I’m not sure it ever exposed itself properly. I didn’t plan it–it found me. Where will you find your poem? It might be in your armpit or behind the ear of a friend. You might have to dig it out. when you least expect them! I love the poem, Lisa. Is this an original of yours. May I read it as an introduction for our community college’s Poetry Slam? You, of course, will be given credit as the author. It is an original and I would be honored if you would use it. Thanks. Each of us should be so loved! The world would be a wonderful place. I have wanted other things more than lovers . . .
To capture Beauty’s hands and lay them on my heart. And, to soothe me, tired winds from the south. These things have I wanted more than lovers . . . Familiar things, while lovers have been strangers. Friended thus, I have let nothing pass. Could possibly touch our passions, sorrows? Her contradictory lament, sadly joyful. ” Friended thus I have let nothing pass”. We are in your arms, blessed Kay. I always like reading “O Captain! My Captain!” By Walt Whitman. This extended metaphor eulogizes President Lincoln and is great in my social studies classrooms to deepen an understanding of the heartfelt loss of Lincoln and how it moved the entire nation. The kids really seem to take it to heart.